When building or modifying your home or office, it is important to first create a floor plan. Floor plans show the relationships between rooms, the general design for the interior of each room, as well as any windows, doors, closets, and fireplaces. 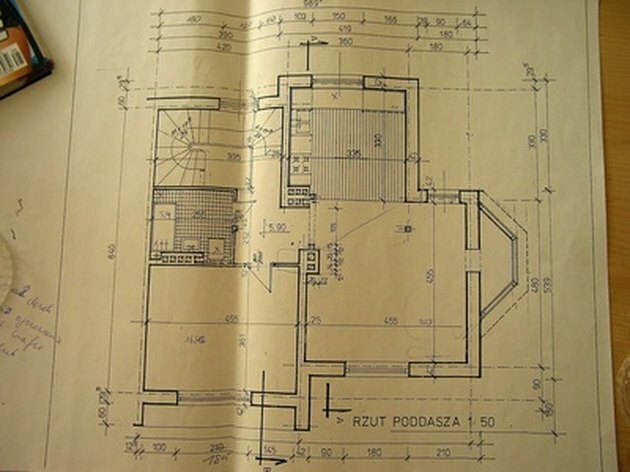 A more complex floor plan, often created by a professional architect, contains electrical information and materials needed. By creating a simple floor plan, you can show your designer or architect what you have in mind for your house. This floor plan has a few added details, but it is fairly basic. Know the dimensions of the outside of your home, or measure them. Do this by measuring the outside walls with a tape measure and recording the dimensions. Draw the outline of your house on graph paper. Create a scale before your draw. Decide how much each square on the graph will equal and write this down. If one wall is 500 feet long, it makes sense to make every square equal five feet. Begin by dividing your house into rooms. Keep in mind that each bedroom should be at least 100 square feet, each living room should be at least 150 square feet, each dining room should be at least 120 square feet, each bathroom should be at least 35 square feet. Also consider placement as you divide the house. The kitchen and the dining room should be close, as should the bedrooms. There should be a bathroom near the bedrooms, and if there are two, another near the communal living space. Allow room for hallways, closets, doors, windows, and large appliances. Design the kitchen. Consider how much workspace you will need, and appliance placement. Put the sink next to the dishwasher, keep the fridge out of the way of the main workspace. Make sure there is ample counter space, and walking space between a center island and the counter, if you have one. Mark where the main components and appliances will be, with squares and labels. Mark doors by leaving a hole in the wall and drawing a door at an angle with an arc in the direction the door will swing. Design the family spaces. Mark doors and windows. It is a good idea to mark where you want to put large items, like couches and home entertainment systems. It is a good idea to use the family room or living room as a buffer between the kitchen and the rest of the house. This cuts down on noise and affords people more privacy. Design the bedrooms. Mark areas for the bed, dressers, desks, windows, and doors. It is not necessary to draw everything, as long as you have a general idea of what you want and know there is enough space. Review your plans. Make sure that the shapes and sizes of the rooms are accurate, that you have included all major appliances, electrical objects, and furniture. Don't forget doors to connect rooms, as well as necessary closets, like in the bathrooms and entryways. The layout should be logical and not haphazard. Check if it works by imagining yourself doing everyday tasks in the house. Envision yourself putting your coat away, cooking dinner, walking through the house, checking on your family, etc. If everything seems to make sense, then you have done a good job drawing a simple floor plan for your new home.